Arrius brand ukuleles are well known to rich musicians from the USA and Japan. The founders of the company put in a lot of time and heart in creating this brand and made it recognizable among guitarists. Now, being part of Martin Smith, existing since 2012. This brand continues to become “ever stronger”. Whereas in the case of classical guitars, the assumption was to provide musicians with instruments with the values ​​of “world’s iconic models” at a slightly more affordable price, in the case of Ukulele Arrius put on a high professional range. ” For many guitar musicians, ukulele is an attractive diversification of instruments, but the quality is in the first place in this case. Yes, there are also some musicians buying ukuleles for tens of dollars, but we do not mean them now. Let’s see how the typical problems of other companies were solved in the case of the tested Arrius UK-1500 instrument. I must admit that the list of innovations is impressive. The body is largely made of solid mahogany, which gives a much stronger sound compared to the competition. But the biggest innovation is the top panel made of corrugated maple – this construction has left the competition far behind when it comes to decaying. 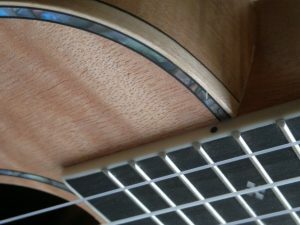 A large part of the binding was also made of wooden elements – a wavy maple and spruce in earlier versions. Thanks to the wood used for the acoustic properties of the resonance box of the tested instrument, I have nothing to complain about, but a bit later. The griffin was made of mahogany, and the bridge was made of an unusual palisander of a brighter color. 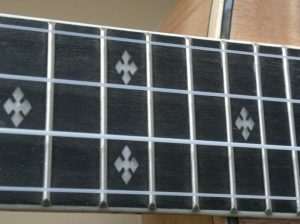 The instrument is traditionally equipped with eighteen frets and great closed type keys. From the technical side, that’s all, so let’s move to more interesting matters. 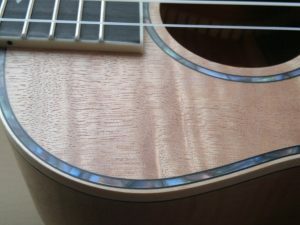 Usually, the ukuleles from the higher price range are made of spruce or Koa. The tested instrument looks different – an unusual solution like a wavy maple makes the ukulele simply sound louder and cleaner. The difference was captured clearly – not only by me, but also by colleagues. Machineries are another advantage. There is no need to conceal the fact that usually manufacturers use the cheapest open ones. In the tested instrument this problem does not exist – the keys keep the attire at a very good level. They walk stably and quite heavily which in the case of ukulele can be considered a plus. As for the convenience of the game, the action of the strings in my opinion is perfect – the game is very comfortable. The strings are quite low, and yet the instrument is extremely loud. There is no question of impure sounds. I will add that the Arrius UK-1500 is the first ukulele in my hands that tunes so well. 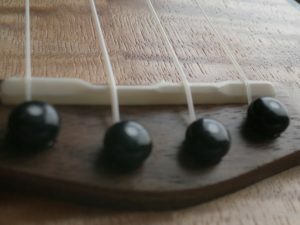 This is probably the effect of very accurate execution and compensation threshold – a real rarity in the ukulele. Arrius UK 1500 is a soprano model, designed according to the manufacturer for those who already know the disadvantages of the cheapest ukulele and want to take the next step, “switching” to good equipment. For particularly demanding users, this may be the first instrument. Either way, it is actually one of the best ukulels I’ve tested.